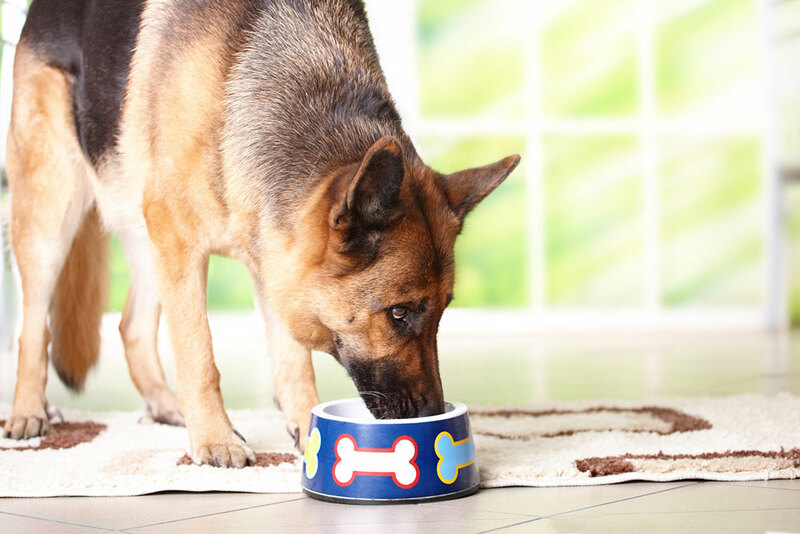 Throughout their lives, our dogs require a complete, balanced nutrition. Depending on their age, breed and activity, will depend on the nutrition they require. Newborn puppies receive total nutrition from their mothers milk for about the first 4 weeks of life. After that, solid food is gradually added, and after a few more weeks they are fully weaned. All puppies have particularly demanding nutrient requirements. Because they grow rapidly during the first months of their life, puppie’s nutritional needs differ significantly from those of adult dogs. They require more calorific energy, around 3 times more than that of an adult dog and more high quality protein, to help create new body tissues as they grow. Puppies also require minerals as part of their diet. This can vary dramatically depending on their breed. For example, large and giant breed puppies should be fed a diet with restricted calcium levels to ensure that their bones do not grow too quickly, causing joint deformities. Establishing a healthy, balanced diet from the beginning is vital to your puppies well being. As always, you get what you pay for. Generally, cheaper diets are of poor quality, containing lots of ingredients that either are of no benefit to the animal, or cannot be digested. What is more, to make these diets tasty for the animal, they generally contain a high level of fat and salt, which is not beneficial for your pet. It is certainly worth considering a premium diet. These diets will be tailored to an animals needs and only contain highly digestible ingredients. This means that the animal can utilise more of the goodness, meaning they require less of the diet and also, produce less waste! These diets contain only the salt and fat content required by the animal. What is more, whilst these diets generally cost more per bag to buy, they generally work out cheaper to feed per day than seemingly cheaper diets! If you would like more advice on suitable nutrition for your pet, please contact the surgery for further recommendation. As our pets become older, the care that they require should change to suit their needs. This ranges from a change of diet to routine blood screening, joint supplements, suitable exercise regimes, brain care and bedding changes to name a few! We invite all dogs over the age of 7 years of age to come along to a Fit For Life appointment – cost £20 (free if you are on Riverside Vet Plan), run by our qualified nurses. At this appointment, we will discuss your pets needs and any changes in their health. We will recommend changes that we think could help your dogs wellbeing.